May was pleasant when it came to the weather: there were just several very hot days and we even got a couple of showers. For me it was hectic and extremely busy. As a result my testing went down significantly. Half a year ago I based my statistics post on the language of the perfumes names. This month I decided to look into brands themselves. I’ve discovered that more than half (66%) of the brands I wore1 or tested2 in May were from France. Neither of the other seven countries in calculation were even close to that number (see the chart). From what country comes the perfume you’re wearing today? 1 When I wear a perfume I apply it to at least three-four points and usually I plan to spend at least 4-8 hours with the same scent so I’m prepared to re-apply if the original application wears off. 2 For the testing I apply a perfume to one area on my arms easily available for the repetitive sniffing. But, most likely, I’m the only one who can smell it. I can test two, sometimes even more perfumes at the same time. SOTD = Puredistance Opardu so that would be from The Netherlands, if I am not mistaken. I continue to be amazed at your recordkeeping discipline. I am a hopeless case and will just live vicariously through you, dear Undina! U – I’m with Hajsuuri…I have no idea how you keep up with the stats but I love it. My SOTD for work was Trayee…VM originates from France and my SOTE is Arpege which is also French…so I guess it’s a French kind of day. BTW, my new post (in the morning) is about the vintage Arpege I am wearing tonight…wait…is that promoting via your blog? Interesting as always, Undina. The perfume I’m wearing today is from Italy (Tawaf by La Via del Profumo). Every month you inspire me to think I should keep track of what I wear…and every month I fail to do so. Sigh. What Chanels did you wear and which Serge Lutens did you test? Chanel No 19 (EdT and extrait) and 1932. As to Lutens, I went though several exclusives to see if I wanted to buy any bell jars when I get a chance. I’m still not sure. I love a spreadsheet that turns into a graph. Wish mine was over half from Oman! @Suzanne, no longevity on an undisclosed ‘fume today so Tawaf is a great idea which I will action right now. Spritz! You are keen. I will investigate. Definitely local bazaar type places. BTW I love your stats pages Undina. That is a Yes from Jordan. Undina, let’s do on the spot reportage. I think you would be a terrific travelling companion Jordan. You keep track of everything Undina! 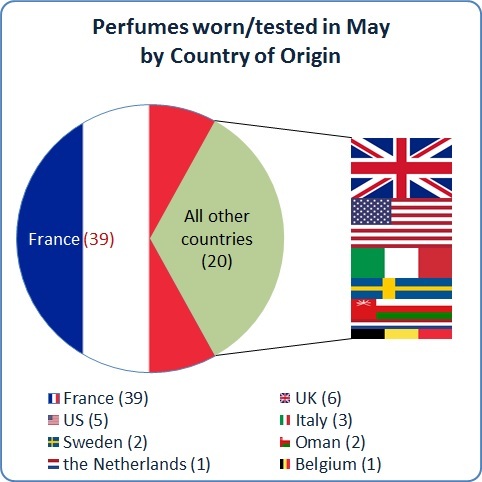 Not only you note what perfume you wear daily but you also check the country of brands origins, numbers of tested, new perfumes. This is very impressive! Lucas, I’ll share s secret with you: I track much more information – notes, noses, groups, etc. :) The biggest challenge is to come up with the idea of what to calculate and create a picture; recording data themselves is easy. Noses next month or at some stage please. I think this graphic is my favorite one you have done so far (purely from a visual standpoint). It’s great! As for the data, that is really interesting. I guess it goes to show how France still dominates the market. My perfume today is from the U.S. Thank you, Natalie! It’s very rewarding to here your praise especially taking into the account that all I had to make it this time was Excel, no software for picture processing. I am interested in the Swedish contingent – scratching my head as to what that could be. I am testing something from the US today, but not properly wearing anything. And I don’t wish to apply more of this! Suzanne’s pick of Tawaf is lovely – ideal for warm summer weather, which we also – uncharacteristically – have today! For a second you made me question my results :) But I checked. It was Byredo – Bal D’Afrique andi Blanche. The weather here now is extremely warm – I can’t say any more how [un]characteristcal it is but I wish it was slightly cooler. I suspected France would take the lead in my stats but didn’t realize how skewed it will be towards that country. Dear Undina, perhaps you can challenge your readers to keep track for 1 month (aspirational) or 1 week (realistic/possible). Let us know what fields to track…the fewer the better :-) (OK, maybe, Brand/Name of Perfume, Reader’s State/Country). Then we can send the stats to you via email (no files); I bet you’ll have a field day with presenting the data! Dear hajusuuri, it’s a great idea! I’ll try to think of a good metric and try organizing my readers before the end of either this or the next month. I will go to Italy in a month and I’ve decided to try give all my Italian samples a try until then. Today I’ve worn Mazzolaris Lei. I thought it would be centered around Lei flowers and I got a bit of a shock as it’s all about cocoa, honey-ish labdanum and vanilla, making it smell like Toblerone, those triangular Swiss chocolates. A bit cloying on a summers day, I’m saving this sample until fall or winter. I suspect partially I owe that French expansion to the upcoming visit to Paris: I also was trying to revisit some of my samples before the trip (see the mostly tested brand ;) ).